How Dubai managed not only to survive, but to thrive, in the wake of the crisis warrants closer scrutiny. So, this past summer, I began investigating the so-called Dubai model of resilient growth, and the challenges that may lie ahead for it. As part of my research, I conducted more than forty in-depth interviews with government officials and business elites, and fleshed out my findings with secondary data sources. With respect to state-led development, Dubai’s approach is typical of Gulf states. Its society adheres to tribal traditions that afford its ruling elite, headed by the royal family, a paternal and omnipotent role in determining the direction and form of economic development. This means that “Dubai, Inc.” can quickly and seamlessly adapt to changing economic circumstances. Dubai is sometimes called the Singapore of the Desert, because, like Singapore, it has experienced enormous state-directed economic growth, and benefits from proactive, visionary leadership that has turned a small city-state with limited natural resources into an important international entrepôt. Moreover, Dubai has done a good job of branding itself to attract the foreign investment and labour needed to achieve its growth ambitions. Like New York, Shanghai, and Las Vegas, which have all enhanced their images through architecture, Dubai conveys its innovation-oriented identity through its cityscape and skyline, which has around 150 skyscrapers, more than any other city except New York and Hong Kong. Dubai also has the first 3D-printed office building, stunning manmade islands, the world’s only (self-proclaimed) “seven-star hotel,” shopping malls combined with aquariums, indoor skiing, and skydiving facilities, and an array of iconic buildings and amusement parks. It also hosts the world’s most expensive horseraces and other lavish sporting events. 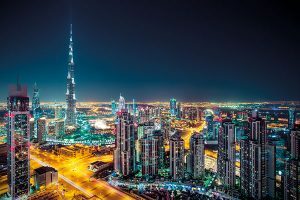 Dubai’s brand is further strengthened by its political stability, safety, tolerance, cultural diversity, and high standard of living, which are a draw for skilled expatriates from around the world. Moreover, the emirate appeals to foreign investors with special economic zones that few other states can match. Dubai has complemented its competitive advantage in attracting high-skill workers and investment with labour policies that also bring in lower-skill foreign workers to power its growth engine. But reliance on foreign workers could run into structural problems down the road. While firms can quickly shed workers during hard times, this then results in labour shortages when conditions improve. Higher-skill workers, in particular, take much longer to attract than to let go. Another risk is that, while the emirate has enjoyed a long period of political and economic stability, a significant regional upheaval could cause foreign workers, whatever their skill level, to take flight, regardless of the promise of high salaries and an attractive lifestyle. Dubai’s reliance on foreign labour thus threatens its long-term economic capacity to withstand future shocks. The ABS model explains Dubai’s economic resilience and its quick recovery after the global financial crisis. But it also helps the emirate adjust its strategy to account for new challenges. Just as a car’s ABS makes it easier for a driver to slow down or change course to avoid dangerous obstacles, Dubai’s state-led development apparatus can realign its attraction and branding activities in accordance with its growth goals and changing circumstances in the Middle East and beyond. On the other hand, if the government fails to fix its structural problem – under-developed indigenous human capital – it will essentially be driving a more dangerous car, one in which it will become difficult or impossible to avoid obstacles without the wheels locking up. Yasser Al-Saleh is a faculty member at the MBRSG (formerly the Dubai School of Government). He has published several books and academic papers on the Middle East, and is the author of The Prospects for Sustainable Energy Innovation within Oil-Rich Gulf Cooperation Council and the co-editor of Economic Diversification Policies in Natural Resource-Rich Countries.